The Solar Bear is built for long days in the sun! These coolers include high performance 1-inch thick high density foam insulation, giving them the most cold chill impact in their class. Additionally their exterior shells are made of an innovative UV-Protectant coating. This coating keeps the exterior of the cooler from getting hot in the sun. If you are expecting prolonged sun exposure, the Solar Bear is your cooler! Exceptional quality inside and out! Great for personal use. Lightweight, easily maneuverable and versatile, the Solar Bear Series features a 1000 denier luggage grade nylon outer shell, with a UVProtectant PU coating. The Solar Bear looks great on the outside but it's what's on the inside that really counts. The Polar Bear houses the thickest and highest density insulation in it's class. It's going to keep you cool on the hottest days. In the world of soft coolers you are only as good as your liner. The Solar Bear features a leak proof/sweat proof FDA food grade liner approved for consumer safe perishable storage. The Solar Bear is built for the long haul with a YKK #10 heavy duty weatherized zipper and utilizes our patent pending zipper sew design, which insures that your cooler works as hard as you play. The Solar Bear series is heavy duty and durable! It's made for everyday use. The Polar Bear soft cooler will keep hot or cold. Quality that lives up to its name! Superior craftsmanship and performance, it keeps ice for at least 24 hours in 100 plus degree heat. Ideal for boating activities, tailgating, camping, sporting events, the golf course, or just sitting around the camp fi re with friends. Nothing keeps cool like a Polar Bear! These reusable and rugged ice substitute cooler packs maintain low temperatures longer than ice or "blue gel" products. The active ingredient is a plant-oil derived "phase-change material". These cooler packs are reusable, non-toxic and biodegradable and are not derived from petroleum products or alcohol like most other cooler inserts. When Arctic Ice approaches its melting point (that's the phase change) it begins absorbing more heat while stubbornly refusing to warm up. It holds a constant, pre-defined temperature until the entire cooler pack finally thaws. These flat panels save time and money when compared to using bagged ice. Simply store in any home freezer until ready for use. These cooler packs are top rack dishwasher-safe. The Alaskan Series is specifically designed to keep your beverages and perishables refrigerated all day or longer. One or two of the large packs is perfect for keeping your medium size cooler perfectly chilled all day long. 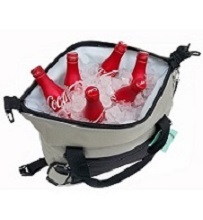 The extra-large pack can be used in extra-large coolers. Large: 7.5" x 9.5" x 1.25" -- 2.5 LBS. Extra-Large: 11" x 8.7" x 1.9" -- 5 LBS. The Tundra series packs maintain a freezer-like temperature in coolers to keep frozen items frozen and are a suitable, safe and re-usable replacement for dry ice. One or two large packs will keep a 15-25 quart cooler at freezer temperatures for hours. The extra-large packs will change any cooler in to a temporary freezer. Crafted with exceptional quality inside and out, these coolers are built for everyday use. They features a heavy-duty 1000-Denier Nylon outer shell, making the cooler lightweight and easily maneuverable. While this cooler looks great on the outside, it's what's on the inside that really counts. The Polar Bear houses 1-inch thick high density foam, giving it the most cold chill impact in it's class. It's going to keep you cool even on the hottest days. Holds 12 Pack, 10 lbs ice. Dimensions:13" x 21" x 13"
Wear the Bear! The most useful and effective cooler backpack on the market. The Polar Bear Backpack Coolers have heavy-duty, extra-padded back straps that allow you to carry drinks all day with ease! Additional features include two stretch open side pockets, a top front mesh pocket and a zipper pocket. Dimensions:7" x 12" x 18"